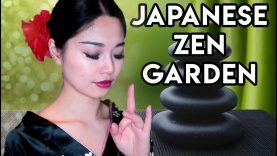 Enjoy the ultimate relaxation of peaceful movements of sand and stones in this whispered Japanese Zen Garden ASMR. I bought this to help me relax so I hope it helps you too! It’s actually so hard to move the sand how you want, I think after a lot of practice I can make pretty patterns, but I still think it’s very relaxing. Thank you to my producers: Eric, Tony, and Jeremy! Don’t forget to check out my new Patreon page for bonus content and awesome rewards like being a part of my Chinese name video!